Because of the high potential for hydrocarbon production in some parts of the Oriskany Sandstone, a large number of reports, articles, and theses report porosity in this stratigraphic interval (Headlee and Joseph, 1945; Harper and Patchen, 1996). Porosity ranges from less than 2 to 12 percent but is generally more than 5 percent in the sandstone intervals. For the GIS, the sand/shale/limestone map of Diecchio and others (1984; their fig. 4) was combined with porosity information from Headlee and Joseph (1945) and Harper and Patchen (1996) to characterize porosity distribution in the Oriskany Sandstone. There are many geophysical logs available for the Oriskany Sandstone interval from which formation porosity can be calculated (Asquith, 1982), if a more detailed assessment is desired. 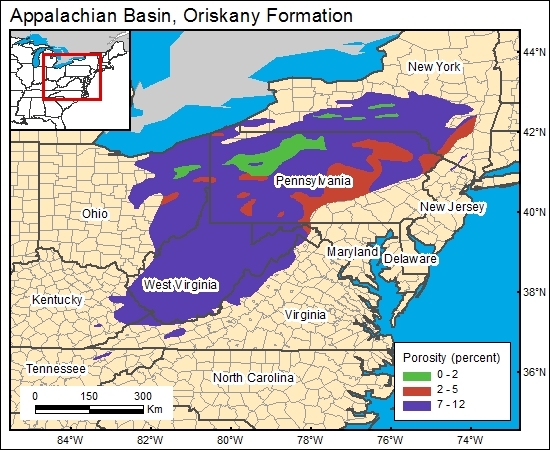 Diecchio, R. J., Jones, S. E., and Dennison, J. M., 1984, Oriskany Sandstone regional stratigraphic relationships and production trends: West Virginia Geological and Economic Survey Map WV-17, 8 plates. Headlee, A. J. W., and Joseph, J. S., 1945, Permeability, porosity, and water content of natural gas reservoirs, Kanawha-Jackson and Campbells Creek Oriskany fields: West Virginia Geological Survey Bulletin No. 8, 16 p.